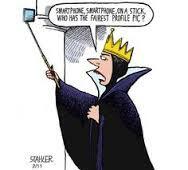 Who is the character on this cartoon? 2ndes Gerund V+ Ing ex corrections + cartoon study + revisions! The cartoon Joana, Marine and Marion chose shows Muhammad who is crying because he realizes some of his followers are silly. 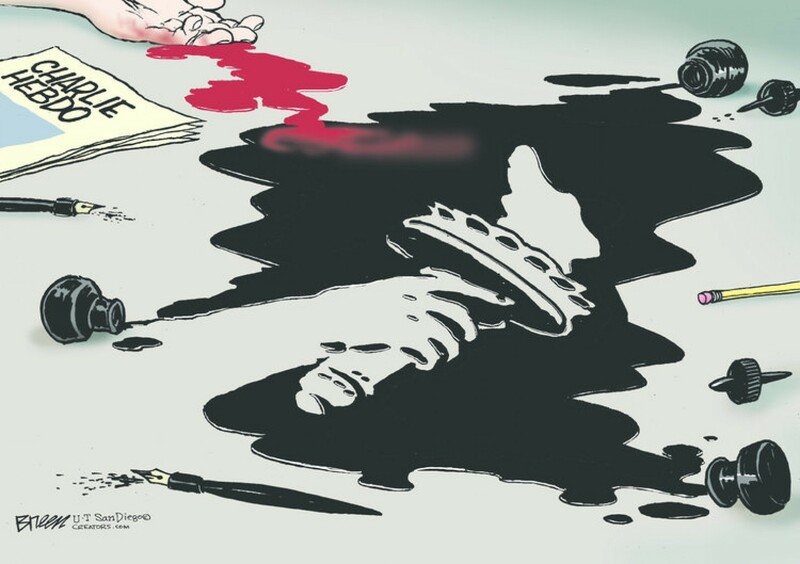 This cartoon is one of the cause / responsible for the cartoonist’s death. Muhammad is the symbol of the Muslim religion, he is the equivalent of Jesus for the Catholics. For extreme islamists, writing about or drawing the Prophet is forbidden because they identify the image / symbol with what it represents. For them it’s a crime against God to represent their Prophet. They think it is a sacred character that we shouldn’t represent because representing something sacred is considered as impure. 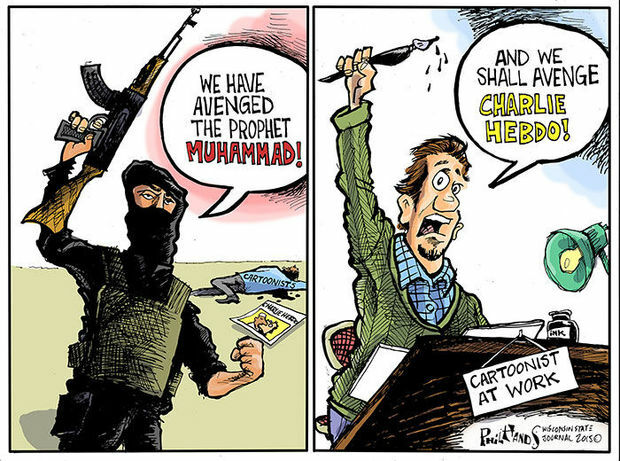 So when the cartoonists from Charlie Hebdo drew satirical cartoons about their Prophet they were furious because their beliefs were attacked. But not all Muslim people agree with them. In France and at school we promote freedom of speech because we believe everyone should be allowed to express themselves. We understand the cartoons were controversial but no one should die for their opinion. On Sunday more than 1 million people demonstrated in Paris as a tribute to the dead cartoonists, policemen and Jewish victims of the terrorists. Emilie’s photograph is really moving and powerful. Written by 210 and 203 students on January 13th, 2015. I’m looking forward to chating with you on the Internet tonight. I feel like buying the latest tablet. This brand new app is worth trying. They can’t stand being tagged on Facebook. She is fed up with people speaking too loud on their phones on the train. She can’t help arguing with her parents about her cell phone. If you keep on / carry on spending this much time in front of your computer, you will have a headache. Instead of going out with her friends, she surfs the Net every night. I can’t stand / hate hearing a cellphone ringing / ring when I’m on the subway (Am) / tube (En). He loves / enjoys creating / designing computer games. Having a computer in your bedroom prevents you from doing your homework. I can’t wait / I’m looking forward to discovering new applications. Selecting your friends on the Internet is worthwhile. / It‘s worth selecting your friends on the Internet. Is this the French 9/11? > On September 9th, 2001 the Twin Towers were / World Trade Centre was bombed in New York. 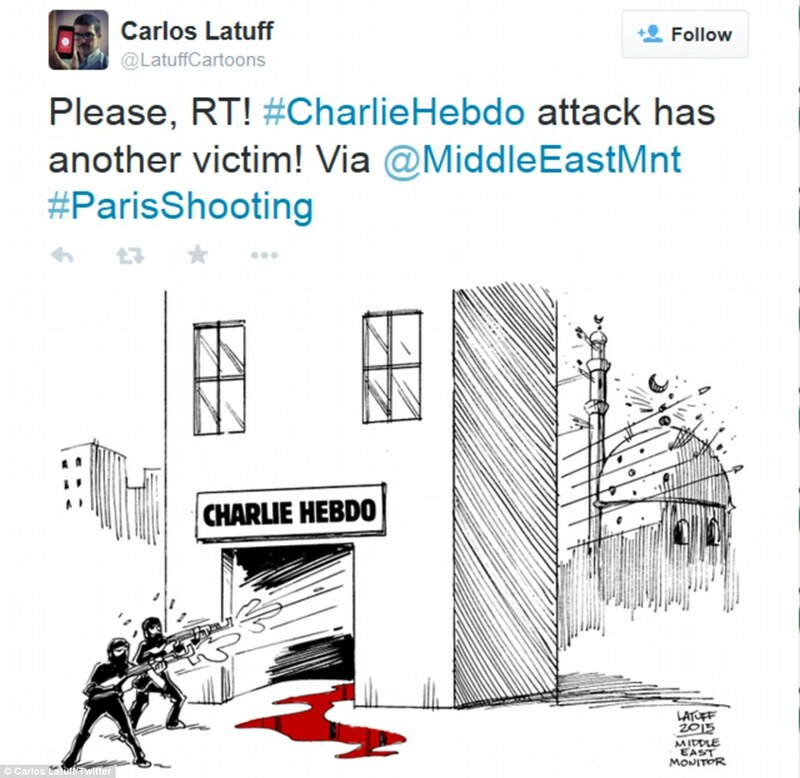 Charlie Hebdo is a French satirical newspaper. C. H was attacked by extreme islamists / jihadists 2 days ago. 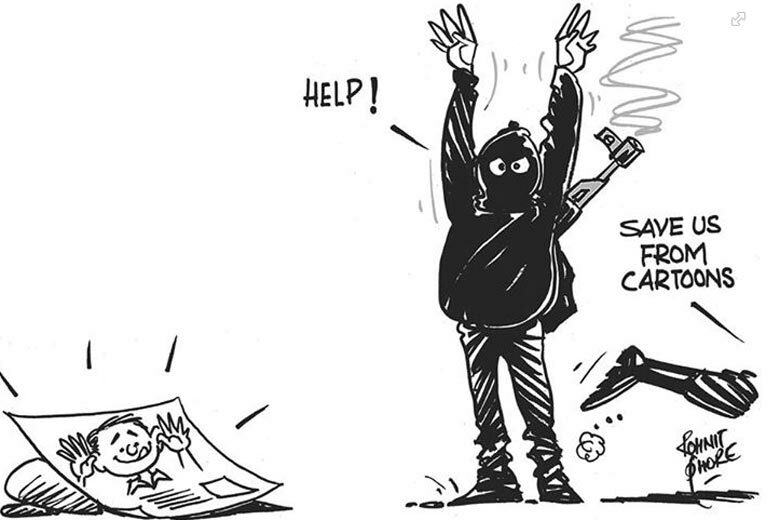 3 men / terrorists killed 12 people including 4 famous thinkers and cartoonists. People are demonstrating to show their support. 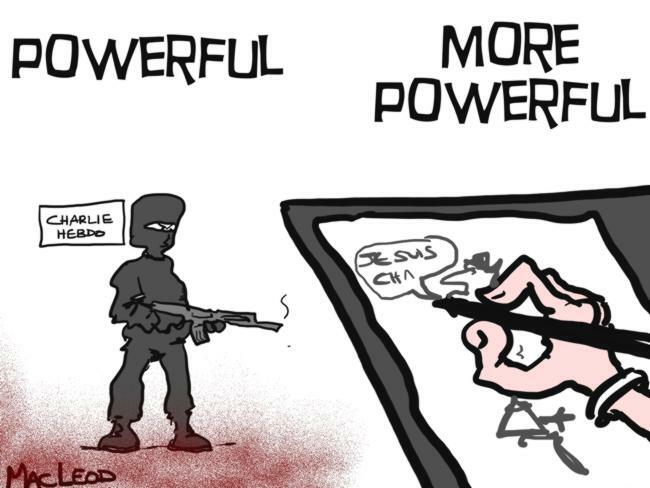 On the Internet people are drawing / posting new cartoons to criticize radical fanaticism and promote freedom of speech. “Charlie” comes from Peanuts by Schulz who created the character Snoopy. 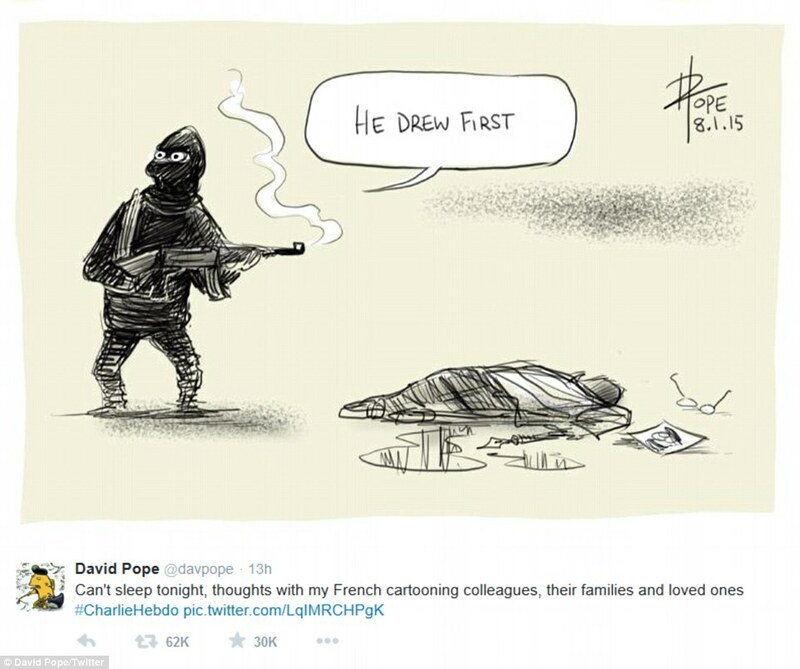 Some people also think it’s taken from the name Charles DeGaulle who died just before Charlie Hebdo was created. This name of the character “Charlie Brown” inspired the title of Charlie Hebdo. Schulz is an American cartoonist who was drawing cartoons before Charlie Hebdo was created. Charlie Brown in this cartoon speaks / tells the truth no one wants to hear. He represents the Freedom of Speech. Two kids are playing / fighting / running around. Charlie tries to solve the situation peacefully. He raises serious issues about the world / philosophical issues* (war / violence). He thinks if kids can’t solve their small problems, they won’t be able to solve serious ones in the future. In the end / That’s why the girl punches him in the face. She says that she had to use violence because ‘he was making sense’ / telling the truth. She chose to ignore the truth. > Radical Middle Eastern islamists are targeting 2 Western symbols: democracy and capitalism. 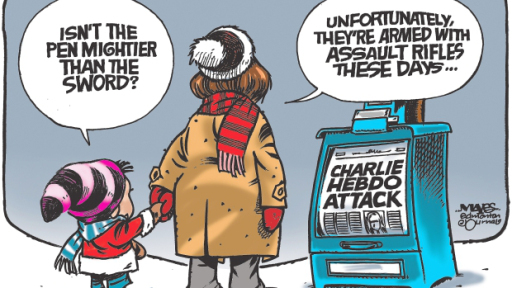 > The difference between 9/11 and Charlie Hebdo is that less people were killed in C. H.
>C. H. is a symbol for freedom and democracy whereas 9/11 is a symbol for economical power / money / capitalism. >Both events show Western values under attack. Freedom of Speech was targeted / attacked. Both events show Western values under attack. 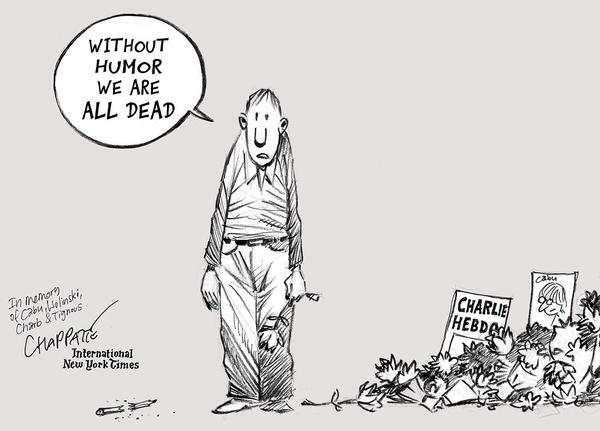 HW – Tuesday Find an English cartoon representing the event in Charlie Hebdo and present it orally ! 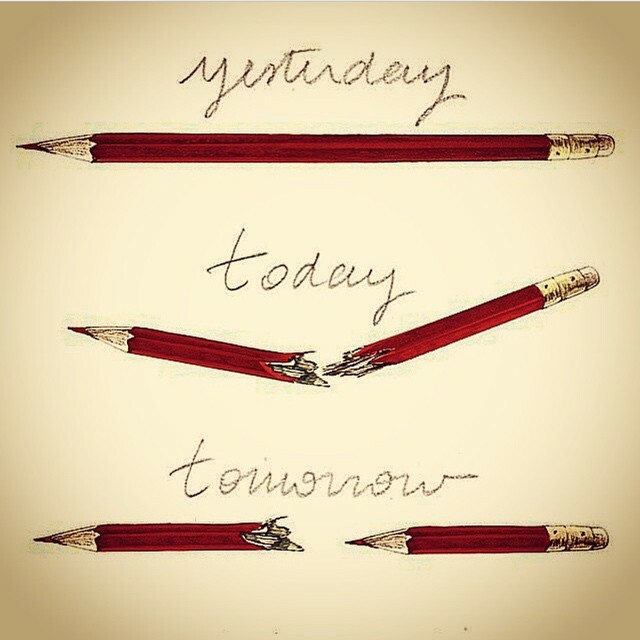 Use words from your lesson!